We go back-to-back with Robert Englund films and analyze Urban Legend (1998), a slasher film that follows a killer at a New England university who murders students in ways similar to those described in various urban legends. The film follows a group of friends who attend Pendleton University, the setting of student murders just as it supposedly was during the “Stanley Hall Massacre.” Natalie, the female protagonist, must try to find out who the killer is as her friends are killed systematically, all in ways that resemble urban legends (Table 1). 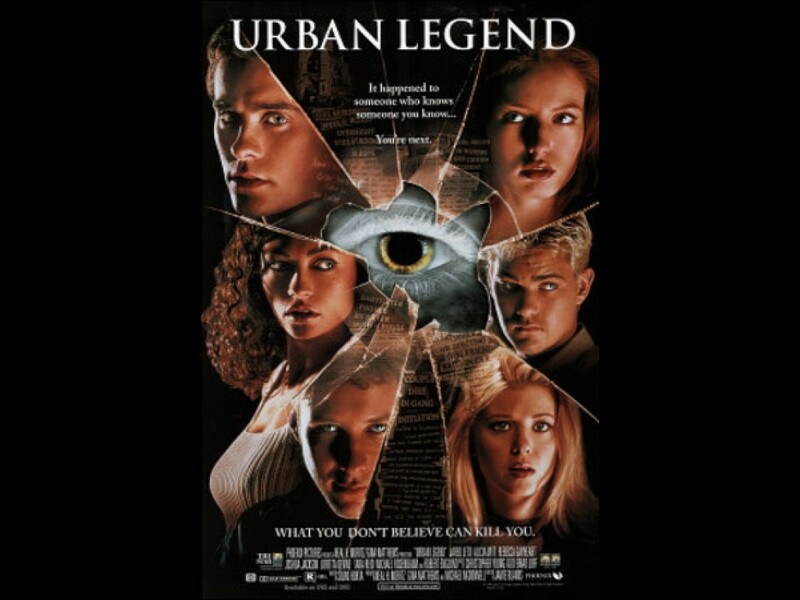 As the title suggest, urban legends are a large part of popular culture and often speak to the fears, anxieties, and biases of that culture. In doing so, they provide insight and give us an idea of the moral fabric of a community. Urban legends are cautionary tales of contemporary folklore that identify taboos represented in all cultures that capture four common themes: a) misunderstandings, b) poetic justice, c) business rip-offs, and d) revenge. The main theme captured in Urban Legend is revenge. While not an ego defense mechanism per se, revenge may be related to acting out; defined as a direct observable action on an unconscious conflict to avoid being conscious of the conflict. In the film, the murderous impulses are not discharged towards the actual victims, [spoiler alert] but instead towards the protagonist, Natalie, who was involved in the accidental death of the killer’s boyfriend. This vengeance is the killer’s way of coping with the death of her boyfriend (anger stage of grief), which speaks volumes about her poor coping skills. One would query a developmental history of a broken family life or poor support system that did not allow her to heal properly following the death. The film also depicts free-floating anxiety, mass hysteria, and a sense of foreshortened future as the students realize that the murders share a similarity to common urban legends. These folkloric tales suddenly become reality for the students, therefore causing them intense anxiety. It is all too real, particularly because the school was implicated in the murders from so many years ago. Fear is a hypothalamic emotion, driving people to extreme behaviors; in the film, students experience doubt of the murders, grow suspicious of each other, while others simply choose to ignore them altogether. No matter the reaction, the murderer had no preference. She did not single out the weak students or those who were most afraid. Rather, she was systematic and organized. These were researched murders that indicate a cunning, methodical mind at work. Finally, the film itself takes on the aura of an urban legend as it relates to the urban legends so closely that you feel as though they may in fact be grounded in reality.